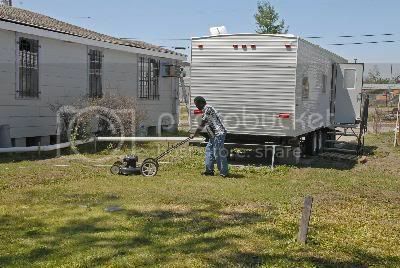 The Federal Emergency Management Agency is still allowing more than 52,000 households displaced by Hurricane Katrina to live in travel trailers despite documented high levels of formaldehyde -- but yet it has cautioned its own employees about entering stored trailers over concerns about their exposure to the chemical, a known respiratory irritant and carcinogen. What an incredible double standard. They're telling their employees it's too dangerous for them to go in the trailers yet we're letting people continue to live in these trailers. In July, Waxman's committee held hearings at which FEMA Administrator R. David Paulison promised that his agency and the Centers for Disease Control and Prevention would soon begin testing the trailers' air quality. But as Keteyian reported, the agencies have not begun carrying out these promised tests because they have not yet identified "action levels" for responding to the results. Paulison told the Washington Post that there is in fact no double standard for Katrina survivors and FEMA employees. The difference, he said, is between trailers that have been aired out by occupants and those closed up in storage. A new FEMA memo reportedly states that the stored trailers must be ventilated by forced-air pump for 30 minutes before workers can enter.